A OH-SO-SWEET kind of day! Nearly 30 tons of AVONTUUR sailed goods from Nicaragua, Honduras, and Mexico was unloaded on Monday, May 14, 2018 in the bright sunshine at the harbour museum in Hamburg. At first Yogi Tea unloaded its 10 tons of cardamom which is one of the main ingredients of its herbal and spiced teas. The 18 tons of organically grown coffee beans for the German coffee traders El Rojito, Café Chavalo, and Teikei Coffee plus 1.5 tons of cocoa beans for the Austrian chocolate manufacturer Zotter were then unloaded traditionally by hand with the support of 70 volunteers. The bags were pulled out of the cargo hold of our AVONTUUR onto the floating pontoon then transported on sack trucks to the crane where they were then lifted onto the quay. Some of the tricargo, Ahoi Velo cargo bikes and El Rojito bikes then loaded up to 300 kilos of the coffee and cocoa beans to be transported to the interim storage facility an environmentally friendly way….. of course! For this, the Hamburg association awarded El Rojito and TIMBERCOAST a new environmental partnership award given by Environment Senator Jens Kerstan. Around 4 p.m. the last coffee bag from Mexico was unloaded for Teikei Coffee, heralding the end of an exciting and moving day. Once again, the spirit of the Timbercoast community showed itself: If everyone pulls together, something great comes of it. The event attracted not only general interest but also former dock workers and a lot of press. 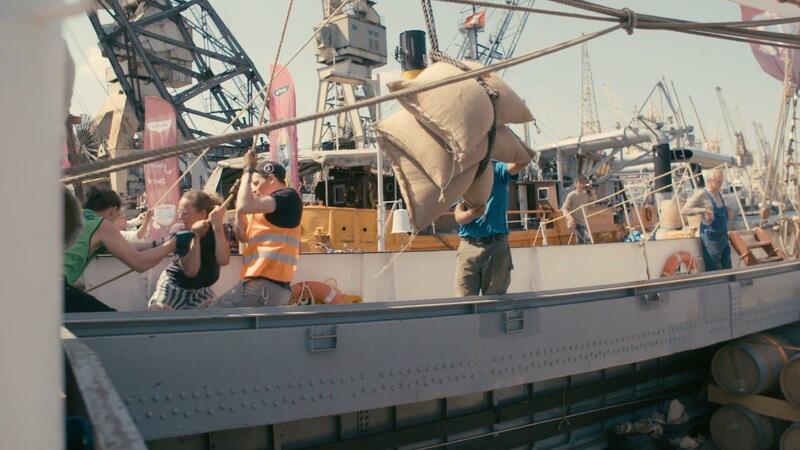 We would like to thank the Hamburg Hafenmuseum, all the volunteers, Senator Jens Kerstan and of course our cargo partners Yogi Tea, Teikei Coffee, El Rojito, Café Chavalo, Zotter, Brigantes, and New Dawn Traders who are helping us raise the awareness about a clean shipping culture. Please support our efforts with the purchase of AVONTUUR sailed goods from online shop.